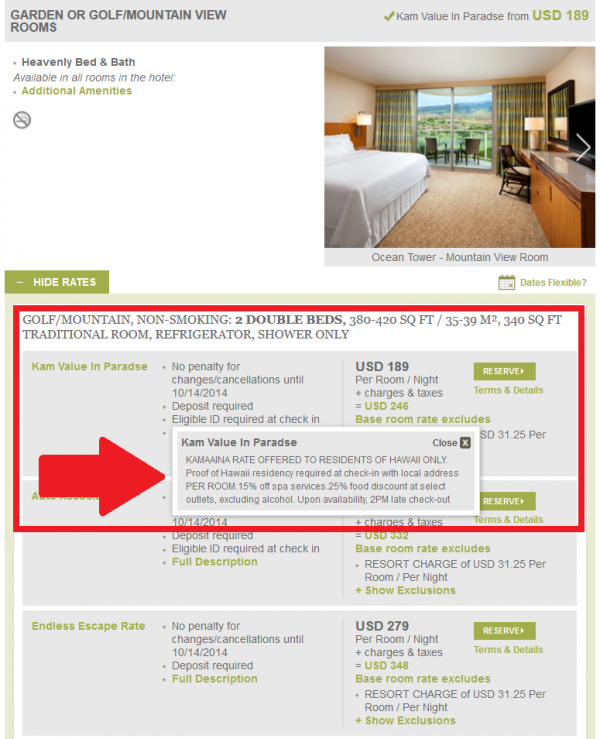 Starwood has great Kamaaina rates for residents of Hawaii (get local ID and address) that you can price and book on SPG.com. Note that these rates are available when the hotel is not expecting full occupancy, may offer upgrades and late check outs based on availability, and food and beverage discounts. 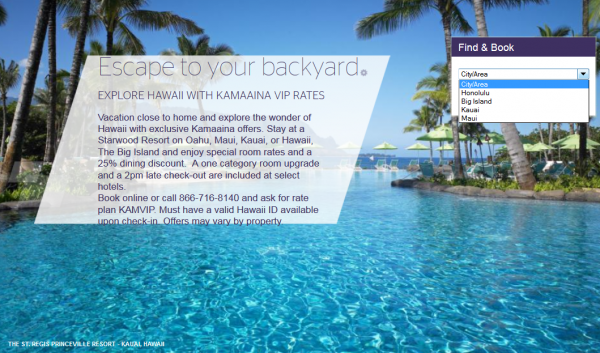 You can access Starwood’s Kamaaina rates here. 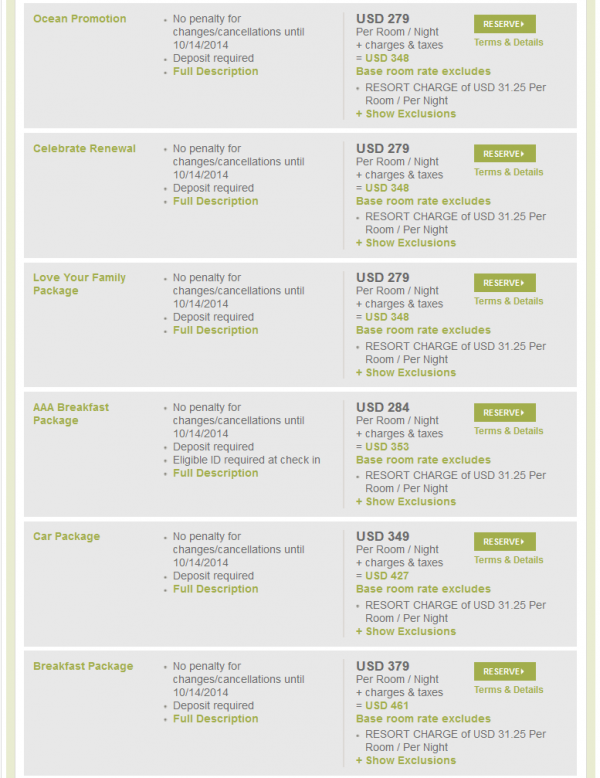 You can open island specific price grid showing the lowest rates that the hotels are offering. The Kamaiina rate is $76 lower than the second lowest rate and seems to offer significant savings for local residents. If you are traveling to Hawaii a lot, it could be worthwhile to get a local ID and address that you could use. Many of the hotels and other establishments are offering special discounts that you can get by showing a local ID. 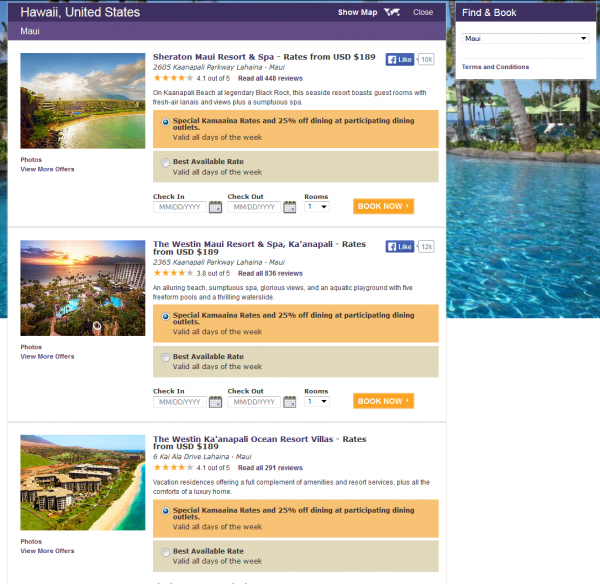 Offer is valid at participating Starwood Hotels & Resorts in Hawaii. Guests must show valid Hawaii ID at check-in in order to receive these exclusive rates. 2 pm early check-in and 2 pm late check-out available at the Sheraton Princess Kaiulani, Sheraton Waikiki, Moana Surfrider, A Westin Resort & Spa, The Royal Hawaiian, A Luxury Collection Resort, The Westin Maui Resort & Spa, Sheraton Kona Resort at Keauhou Bay and The St. Regis Princeville Resort based on availability. 2pm early check-in and 2 pm late check-out NOT available at the Sheraton Maui Resort. 25% off meals at participating restaurants. Note that the dining discount at The St. Regis Princeville applies towards breakfast and dinner at Makaha Terrace only. 5% discount with participating car rental companies. Room upgrade is reflected in the room rate shown and no further upgrade will be given from the confirmed room category at the following participating properties: The Royal Hawaiian, a Luxury Collection Resort; Sheraton Princess Kaiulani; and Sheraton Kona Resort & Spa at Keauhou Bay. Upgrade to suite not available. Room upgrade is reflected in the room rate shown and no further upgrade will be given from the confirmed room category at the following participating properties: The Royal Hawaiian, a Luxury Collection Resort; Moana Surfrider, A Westin Resort & Spa; Sheraton Waikiki; Sheraton Princess Kaiulani; and Sheraton Kona Resort & Spa at Keauhou Bay. Upgrade to suite not available.